Charming and elegant, this stylish coat for toddlers with long sleeves and hood is highlighted by its complex ruby red embroidery. Painstakingly adorned by skilled craftsmen, the refined embroidery unfolds in authentic ethnic signs decorating the chest, sleeves and hood in elaborate geometric forms. 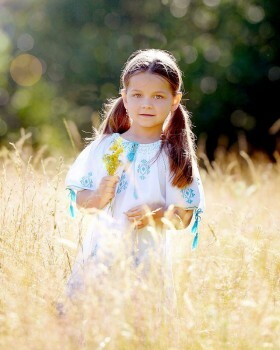 Comfortable thanks to its loose cut and delicate fabrics, this ethnic coat with stylish embroidery is both a warm and practical accessory that your little girl will love immediately. 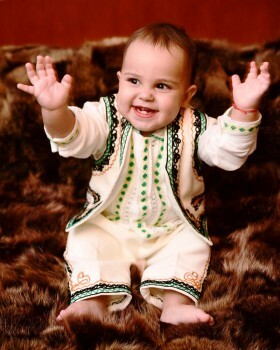 This butter-colored ethnic clothing decorated with ruby red color embroidery and fully lined is ideal both as a centerpiece for christening outfit and for cold winter days. 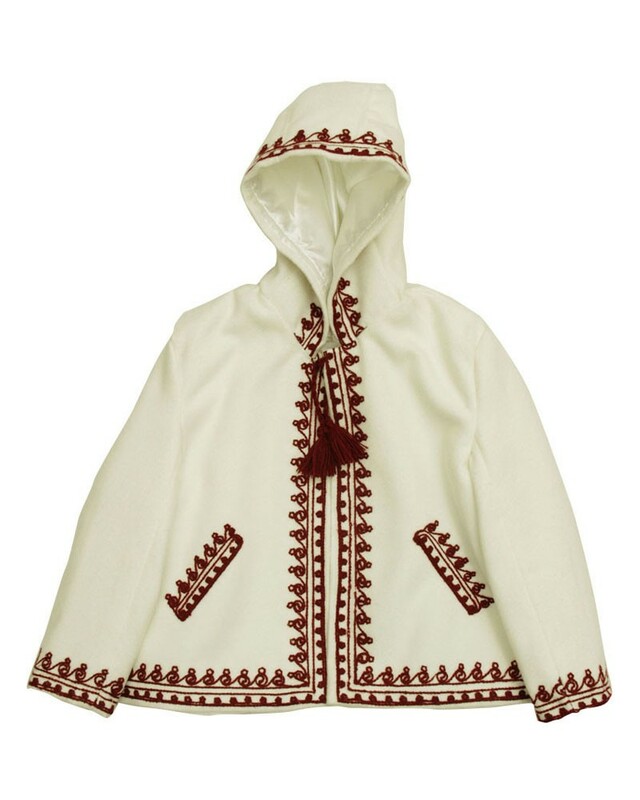 This ethnic coat for kids is embellished by hand made embroidery, artistically crafted by skilled Romanian artisans. The stylish ruby red embroidered coat has long sleeves and hood and is made of synthetic wool. Hand wash in warm water with mild suds and use moderately warm iron. Do not bleach or tumble dry. To protect the embroidery, you are advised not to use the iron directly on it. 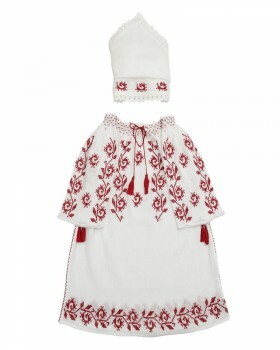 Your little girl will love this embroidered traditional coat, adorned with painstakingly authentic folk decorations. This coat can be made to order in other colors of embroidery, both for girls and for boys. 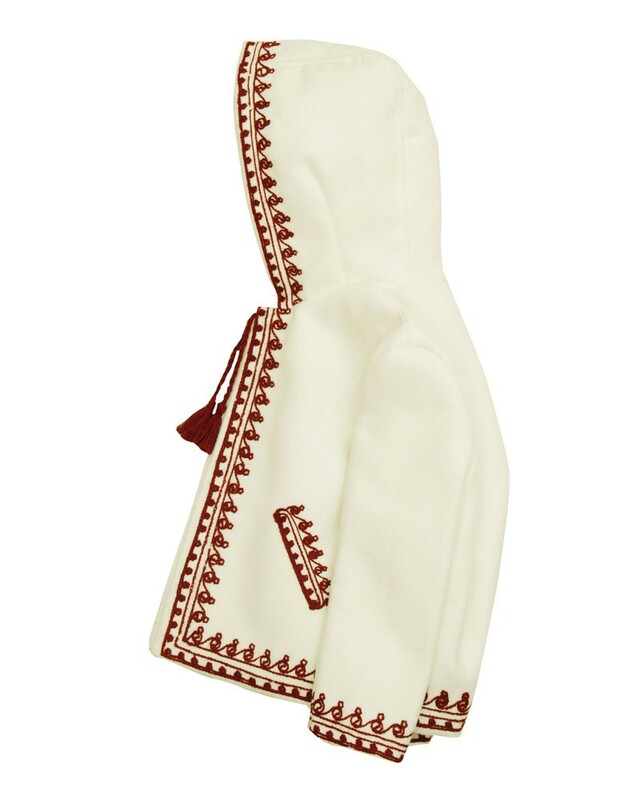 The ethnic coat can be worn as a centerpiece of baptism outfit, when matched with christening embroidered dress and scarf but is also a comfortable outfit for cold winter days, being both warm and stylish for your baby girl. Inspired by the beauty and opulence of 17th century nobleman's clothing, formerly worn by wealthy children, but keeping some of the peasent clothing features, this stylish ethnic coat can easily become la piece de resistence of your baby's wardrobe. Painstakingly adorned by skillfully craftsmen, the refined embroidery unfolds in authentic ethnic signs decorating the chest, sleeves and hood in elaborate geometric forms. For a complete christening outfit, we recommend pairing this coat with the long-sleeved handmade embroidered dress and the handmade scarf decorated with lace and embroidery. The dress and scarf are 100% cotton and are hand crafted by folk artists and embroidered with ruby red thread on the finest cotton fabrics. Anilu.ro guarantees the top quality and uniqueness of handmade clothing items, made by rare artisans who are living on forgotten lands of Romanian villages, in the Carpathian Mountains. Inherited form generation to generation, from mother to daughter, for centuries, the process of creating authentic Romanian blouses is unique in the world and can last from several days up to weeks. The legendary Romanian craftsmen sew by hand the geometrical and floral motifs on what will end up to be a unique masterpiece. Therefore, the authentic Anilu blouse is made entirely by hand, just like in ancient times, sewn with different types of hand stitches, using various colors and models, varying from a part of Romania to another, through a painstaking and lengthy process.